It's that time of year again. 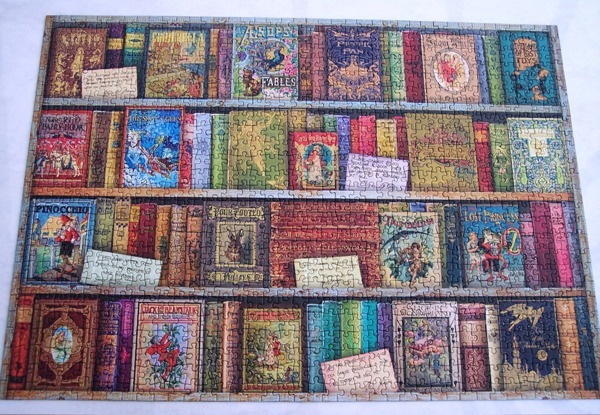 Spring has sprung and Carl's Once Upon a Time challenge is with us once again. There are all kinds of options so please check out Carl's sign-up post. 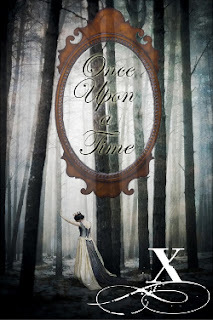 Which is to: Read at least 5 books that fit somewhere within the Once Upon a Time categories. They might all be fantasy, or folklore, or fairy tales, or mythology… or your five books might be a combination from the four genres. I have a few books I want to read and have created a Goodreads shelf here. I own seven of them and may or may not buy the other two. Hopefully I can get a few of them read as they've been on my TBR pile for years! Happy reading and thanks to Carl once again for hosting. 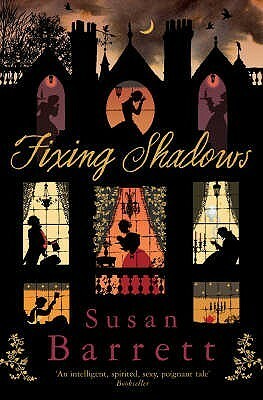 A slightly odd book, set in Victorian times, today. It's Fixing Shadows by Susan Barrett. The Duchess of Fainhope has just given birth to a son but sadly the child is stillborn. Downstairs, unbeknown to all, her children's governess is doing the same thing, but her son is alive and healthy. The duchess needs an heir, her husband having recently died. If she doesn't produce an heir the estate goes to her brother-in-law's eldest son and she will be turfed out of her own home. She goes down to Miss Mantilla, the governess, and basically demands to swap the babies for the sake of them both. Miss Mantilla agrees. A bond is formed between the two women, never to be broken. The governess won't say who her child's father is and the duchess does not press her. She's not really interested, her only desire is to pass George off as her own. And this she succeeds in doing despite the machinations of the sly doctor who is also a sexual predator. He 'ruins' the nursery maid, Lucy, who ends up in London, thus losing poor, unintelligent, George, the only person who is kind and treats him as a person. That's basically the plot of this Victorian melodrama type of tale. 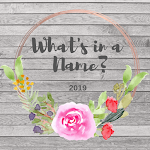 It follows the lives and adventures of several groups of people... the Duchess of Fainhope, Miss Mantilla and George, Lucy in London, pregnant and alone, Miss Mantilla's two sisters and father who also live in London. These three groups of people form the basis of the story, and their tales intertwine, but many more characters enter, occupy centre-stage for a while, and then disappear off. It's a very broad story indeed. Convoluted, full of coincidences and a tiny bit tragic in many ways. It underlines very clearly the plight of women in Victorian times, whether they were upper class and there just to provide the heir, middle-class and quite often in straightened circumstances and having to make a living governessing or being fake mediums, or just plain poor and in danger of ending up in the workhouse. It's depressing to be honest but it wasn't really a depressing book. That's why I called the book 'odd'. The author has a writing style that is hard to describe, you might call it flippant perhaps, but there's humour there and that relieves a lot of the sadness. It felt a bit like Anthony Trollope's writing... 'These sad things are happening here but it's all right, bear with me, watch and listen, and we'll see how it all works out'... very much that kind of thing. To be honest, although I happily read to the end, the book never really properly engaged me. I don't think I was completely happy with the writing style even though I like Trollope. And perhaps another reason for my reticence is that very few of the characters were all that likeable, apart from Lucy and poor old George. That said, I suspect it was quite hard to be a nice, benevolent sort of person in the Victorian era, times being so tough and wretched for so many... if you didn't look after yourself no one else was going to, that's for sure. So, an interesting, if not entirely successful book for me. It's been on my bookshelves for nearly ten years so it's about time it got read, thus it's my book ten for Bev's Mount TBR 2016 challenge. Two books set on or around the sea today. I didn't plan to read two sea themed books in a row, it just happened... as it does sometimes. 'Serendipity' I think they call it... given my love of the sea and books about it. 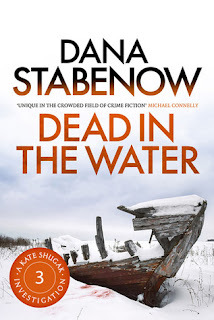 Anyhow, with out further ado - and rabbiting on - the first book is Dead in the Water by Dana Stabenow, book three in her Kate Shugak series. Kate is crewing on an Alaskan crabber, the Avilda, having been placed there by Jack Morgan, her investigative boss and also her lover. Two men went missing off the trawler when they left it to go ashore on an island in the Bering Sea. The Aleutian chain is remote with some of the wildest and most unpredictable weather on the planet. Not somewhere to get stranded and the men were given up for lost, rather too easily in Jack's opinion, by the captain of the Avilda. The families of the missing men naturally want to know what happened and Kate is there, undercover, to find an answer to that question. Kate realises only too well that her life is very much in jeopardy here and not only because the work is exhausting and extremely dangerous. There are other forces at work and she must use every bit of her ingenuity to solve this mystery and to stay alive. Wow, talk about a sense of place. I've read about The Aleutian Islands before but never quite in this manner. During the first chapter the reader is utterly transported to a trawler, in the middle of a storm, off that chain of islands, and it's rivetting. This is why I love to read crime books that are set around the world... for me it's another method of armchair travelling, every bit as effective as reading non-fiction travel writing. Fantastic. I learnt about fishing in the Bering Sea and how merciless it can be for the men who do it. I learnt some of the history of the Native American Aleuts - how they were moved off various islands during the war and so on. (I would be interested in finding out more about that.) And all the while enjoying an excellent murder mystery story. That aspect kept me guessing all the way through and the danger Kate was in throughout the book was real edge of the seat stuff. What more could you possibly want from a murder mystery? Brilliant. So glad I went back to this series. 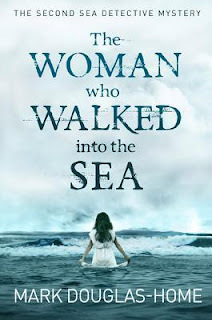 Next up is The Woman who Walked into the Sea by Mark Douglas-Home, book two in his 'Sea Detective' series. Single mother, Violet Wells, was adopted as a baby and has no idea who her parents were. A solicitor from Inverness brings her an anonymous note he's received, telling her that she had been left, as a newborn baby, at a hospital in Inverness and that her mother's name was Megan Bates. And thus begins a long journey of discovery for Violet. 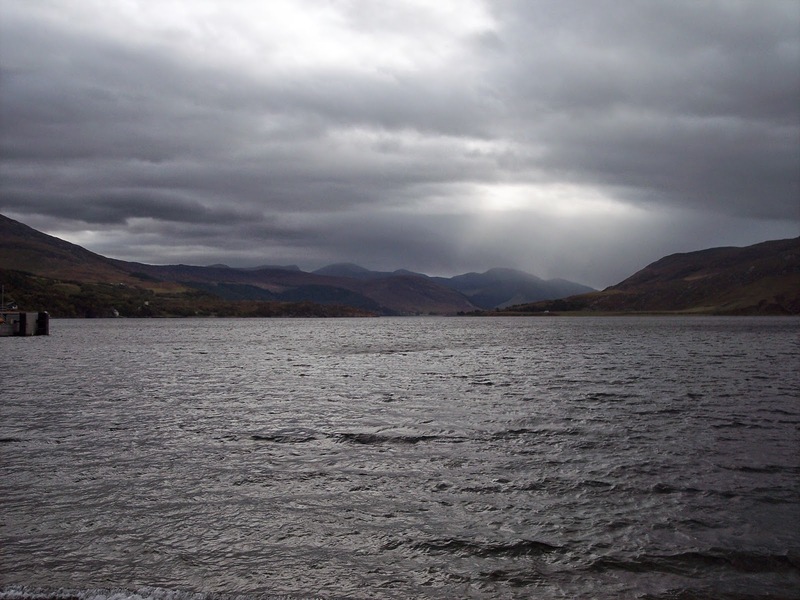 She travels to the town of Poltown near Ullapool on the western coast of Scotland. She soon discovers that her father was William Ritchie, married owner of the local 'big house', with whom her mother had had an affair. She also comes into contact with the elderly Mrs. Anderson who had been the Ritchie's's housekeeper for many years. What does she know? The other person she comes across is Cal McGill, an oceanographer, now known as the Sea Detective after being connected with various criminal investigations connected to the sea. Violet has been led to believe that her mother committed suicide by walking into the sea after the father of her baby had abandoned her. But is that the truth? Many people know more than they will admit to and discovering 'the truth' turns out to be more dangerous than either Violet or Cal had anticipated. Goodness, what a brilliant series this is. (I say 'series', so far there are only two books and I can't discover whether book three is actually out yet... possibly this May?) I thought the first book, The Sea Detective was really excellent but, if anything, I think this one was even better. Book one had a lot of threads going on and you had to keep your wits about you to keep up. Not so this one, which was all about Violet Wells and her search for the truth about what happened to her mother. The story is full of family secrets and loaded with some very odd characters indeed. People are not what they seem and it's intriguing and compulsive reading. Add to that the setting of the coastline of Wester Ross and you have the perfect book for me. We saw a bit of that area in 2014 and I fell head over heals for the sheer beauty and grandeur of the area. 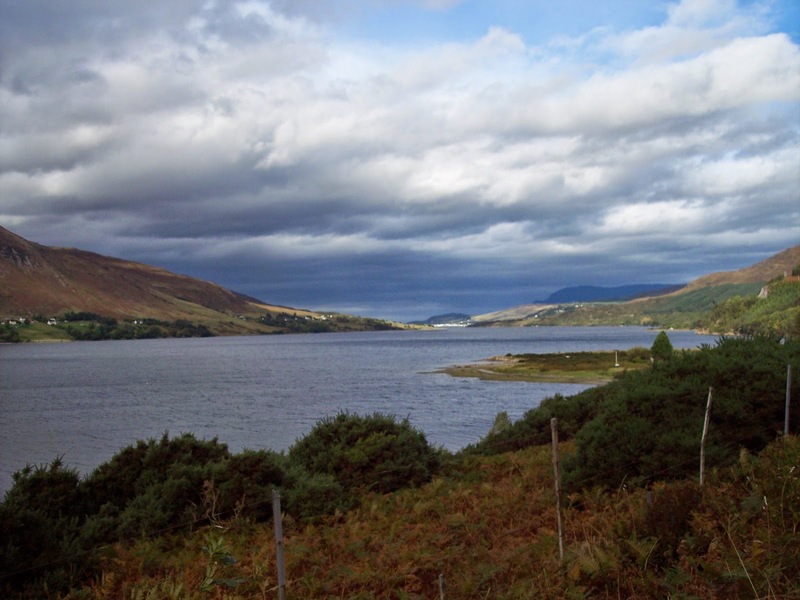 It's a character in the book as much as any of the people and is portrayed so well, no reader could fail to be transported to the west coast of Scotland while reading it. I literally cannot wait for the third book to come out. I love, love, love this series... what a terrific writer Mark Douglas-Home is and I'm so happy to have discovered his writing. And just to finish, a couple of photos I took in 2014 of the area around Ullapool from this post. 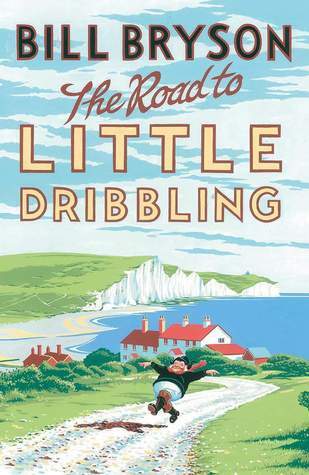 Bill Bryson's The Road to Little Dribbling is my book nine for Bev's Mount TBR 2016 challenge. I've been reading it over the last month or so as I sometimes find it more enjoyable to take my time with some non-fiction books. Twenty years ago Bill Bryson wrote a book entitled, Notes From a Small Island, recounting the story of how he landed in the UK as a young man, toured the country and what he thought of what he saw and experienced. A confession is necessary at this point. Some ten years ago or more I started that book, got about two or three chapters in and didn't get any further. I can't remember why, but whatever the reason, I've never been fussed enough to go back to it even though I've read probably four of five of his other books in the meantime. Go figure (I do love that American term). Why then was I so keen to get hold of his new book, The Road to Little Dribbling: More Notes From a Small Island? Again, I don't know. 'Tis one of life's little mysteries. So, the author was in France, with his wife, on the coast of the English Channel (the French call it La Manche, French for 'the sleeve' because it looks like one: never let it be said that the internet is not educational). He looked across and speculated as to which English town was directly opposite them, much to the annoyance of his wife who was trying to read while he was muttering on. In the end she shut him up with, 'Which bit of 'I've no idea' do you not understand?' Or words to that effect. Anyway, despite that lukewarm response from his wife, Bill Bryson decided to find out... it was in fact Bognor Regis... and then to retrace his steps to see what he now thought of the UK, twenty years after writing, Note From a Small Island. Except that he didn't want to go to the places he went to before. So he settled on a route he called The Bill Bryson Line, which was a direct line from Bognor to Cape Wrath in Scotland, with diversions as and where he fancied. And we're talking real diversions here... Penzance, Fishguard, the Norfolk coast, none of them remotely close to the line Bryson had drawn. So, an interesting book one way or another. The author was President of The Campaign to Protect Rural England for five years and that really does show. He takes his travels and investigations very seriously and 'feels' things very deeply, you can tell. People think of Bryson as a travel writer who is funny. And yes, there are funny moments and he writes in an amusing way so that even things that aren't funny 'are', if you get me. But really I came away with two overwhelming impressions from this book. One was how much Bryson loves Great Britain, 'truly, madly, deeply' to coin a phrase. He loves our countryside, our quirkiness, the weirdness of the people. Secondly, at the same time, I think he finds modern life deeply frustrating, stupidity really gets to him and he hates finding it here in a country he loves so well. Oddly, when he goes back to the US and finds it there it doesn't seem to bother him so much, as he expects it. Which, if you think about it, is rather insulting to his home country. And perhaps unrealistic... we have our full quota of mindless stupidity or the following of silly rules here, just like anywhere else. I felt for him as he seems not to get this, plus in some instances - in regards to the UK - I agreed with his stance entirely. And yet... well... eventually I just got a little bit impatient with what was really just a bad case of Grumpy Old Man syndrome. Modern life is what it is and it's not *all* bad. You might think from that, that I didn't enjoy this book, which would be wrong. I enjoyed it a lot to be honest. He's very good at describing beautiful views, retelling bits of history, and recounting encounters with people in a very funny manner. I laughed a bit... not as much as I did with Down Under for instance or, Neither Here, Nor There but there were seriously funny moments. It was also enjoyable to hear his views of places I know... sadly, I had to agree with his view of Penzance, my home town. And it really did tickle me that he tried to eat at a certain pub there on Saturday night without booking. Been there, done that and waited hours just like he did. Let's face it, Bill Bryson is never less than very readable and this book has been 'hugely' popular and I can see why. I confess though that this is not my favourite book of his, but it was a decent read and definitely a keeper. I seem to be permanently trying to keep up with reviews these days. And it's not that I'm reading *that* much, so I've no idea why this is. I think possibly I read these two books really quickly as they were 'quick reads' and enjoyable, so that helps you fall behind no end. 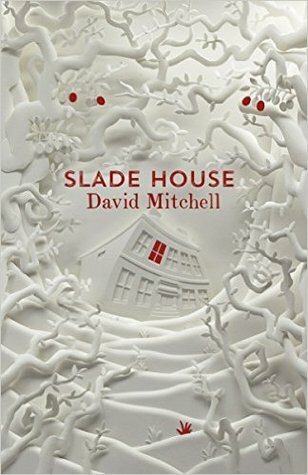 Anyway, first up is Slade House by David Mitchell, which I read because I saw on Goodreads that Margaret at Booksplease was reading it and thought it sounded rather good. Slade Alley is dark and narrow and very easy to miss. Most people don't even know it exists and they certainly don't know of a certain Slade House. Unsurprisingly, as it was bombed out of existence during WW2 and shouldn't really be there. But every nine years on the 31st. of October it is for a chosen member of the public who is enticed inside. The problem for that person is not entering through the mysterious small iron gate, it's leaving... anyway at all. Someone inside the house wants something from each person they take captive. But what? Well, this would be a perfect read for R.I.P. in the autumn. 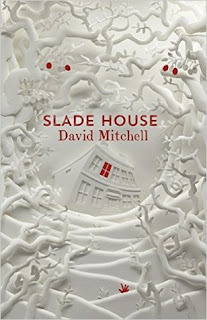 It's my first book by David Mitchell so I've no idea whether or not it's typical. I've always thought of his books as challenging but this was not, so perhaps it isn't like his other books? Regardless... this is basically a very well written supernatural story. It read to me like a Victorian or Edwardian ghost story but is actually set between 1979 and the present day. It also reads like series of short stories as it retells the experiences of each person who is kidnapped, I gather this has something to do with it being started on Twitter as an exercise. Whatever, it's very enjoyable ghost yarn which is nicely executed and quite scary... I enjoyed it a lot. Next, Death of an Airman by the wonderfully named Christopher St. John Sprigg. This is my book five for Bev's Vintage Mystery Cover Scavenger Hunt challenge and covers the category 'Plane'. The bishop of Cootamundra in Australia, Dr. Marriot, is in England on leave and has decided to learn to fly, thus enabling him to get around his huge diocese more easily, back in his home country. He witnesses a crash at the airfield where his lessons are to take place, one, George Furnace, an experienced pilot, is killed on impact. But was he? Study of the dead body proves this was not the case, he was killed by other means. The problem is, it seems almost impossible for this to have happened. 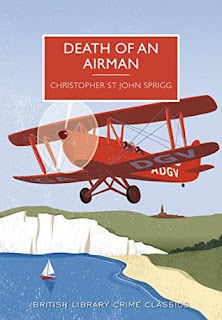 Two police detectives, Creighton and Bray, aided by the bishop, have their work cut out to discover, not only how the murder was done, but also exactly why someone wanted the pilot dead. This is another of the splendid British Library Crime Classics, this one originally published in 1934. It's quite a complicated little story, lots of twists and turns with an unexpected back story for the age. At least I thought so. I won't say what but it's a problem I definitely associate more with our modern age. There's also a lot about planes and flying, a fair bit of which went right over my head but never mind. It wasn't necessary to understand it all in order to enjoy this very good crime yarn. I liked the fact that among the pilots there were a couple of competent females as well as males so that this did not just feel like a Boy's Own Adventure. Not bad at all. And I like the introductions that author, Martin Edwards, does for these BLCC reissues, although I have to say I read them when I've finished the book in case of spoilers. February was a month in which I had no kitchen but I read quite a lot. I now have a kitchen, as of the weekend, so now the job of replacing my kitchen utensils, crockery and so on has begun. It seems it was quicker to remove them than to put them back. Such is life. 6. The Bookshop that Floated Away - Sarah Henshall. Non-fiction... adventures selling books on canals around England. Not as good as I had hoped. 7. Pompeii - Robert Harris. Aquaducts and disappearances and weird things happening in the lead-up to the eruption of Vesuvius. A cracking good read. 8. Whose Body? Dorothy L. Sayers. Excellent vintage crime yarn with Lord Peter Wimsey and friends. 9. Miss Pym Disposes - Josephine Tey. Yet another excellent vintage cime story, set in a college for the training of PE teachers. 10. Murder as a Fine Art - David Morell. A dark crime story set in Victorian times with the author of Confessions of an Opium Eater, Thomas de Quincey, as the main character. Excellent. Loved it. 11. Findings - Kathleen Jamie. Beautiful non-fiction book about Scottish wildlife and scenery. If you love Scotland you should read this. 12. A Fatal Thaw - Dana Stabenow. Murder in Alaska, Kate Shugak investigating. Surprised at how much more I enjoyed book two than book one. Super read. 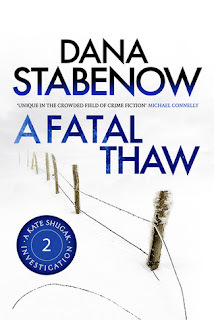 A Fatal Thaw by Dana Stabenow was a terrific murder mystery with a snowy, mountainous setting... the kind I really love... and interesting, quirky characters. Can't wait to read more about Kate Shugak and her murder investigations in Alaska. 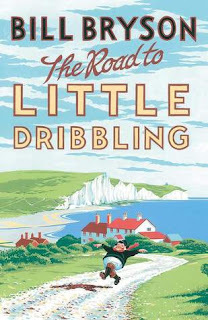 I'm currently reading two books, The Road to Little Dribbling by Bill Bryson and Slade House by David Mitchell. I'm enjoying both and will include them in my books for March even though I'm over halfway through each of them. It seems I really am geeky enough to worry about such things. Happy reading.